Alvin W. Wolfe, Ph.D., Susan D. Greenbaum, Ph.D., Kevin A. Yelvington, Ph.D.
U.S. fisheries legislation requires National Marine Fisheries Service (NMFS) to attend to the critical social and economic issues surrounding the definition and identification of fishing communities, and to the effects that changes to the physical environment and regulatory decisions can have on such communities. To fulfil their mandate, National Marine Fisheries Service (NMFS) sponsored the research entitled Identifying Fishing Communities in the Gulf of Mexico to study the economic, social and cultural status of potential fishing communities along the Gulf of Mexico. NMFS contracted the research project to Impact Assessment, Inc. to study 80 plus potential fishing communities in the Florida Gulf Coast. I worked as an intern in the research and visited the communities with other team members. The task of our project was to provide NMFS with basic profiles of fishing communities for NMFS to develop a culturally appropriated intervention. Research methods include Rapid Assessment Procedures (RAP), semi-structured key informant interviews, participant observation, and archival and secondary research mainly for community histories. Apart from my internship research, I also conducted some additional interviews and observations for my thesis. 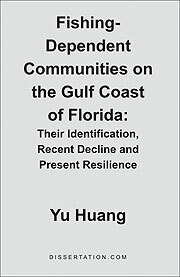 My findings indicate that fishing communities along the Florida Gulf Coast encounter with challenge from increased regulation, dumping seafood imports and virtually uncontrolled waterfront development. By a comparison of three groups of fishing communities, i.e., diminished communities, residual communities, and resilient communities, the thesis explores how communities respond to the challenges and encourages fishermen to take action to preserve their generation-long fishing tradition. In conclusion, the thesis suggests that a solution to ease the decline of fishing communities requires cooperation of all parties concerned, including the fishery regulatory agency, commercial fishermen, and the federal and local government.